JUN Tea is another delicious fermented tea option and can be done as a Continuous Brew. Because JUN can mature faster than Kombucha, it is even easier to have plenty of fresh brew on hand. Although JUN is a cousin of Kombucha, all the basic concepts of Continuous Brew will apply, meaning that set up, SCOBY care, maintenance and more are essentially identical. The main differences are that JUN requires 100% RAW honey for brewing, is best when made with green tea, and can be brewed at a slightly lower temperature for a shorter time. If you select the JUN option, your kit will include 2 JUN Cultures, 100% Raw honey, and our Green Goddess Tea Blend for perfect JUN or Kombucha. The JUN Cultures work well with either the RAW honey we provide or your own local 100% RAW honey. The Kombucha Mamma Continuous Brewing Complete System w/ Modern Porcelain Crock is our most popular package. It has everything you need - just add water! Continuous Brewing Kombucha is easy and fun but can feel intimidating. This system takes the guesswork out of the CB process, offers all the supplies you need for brewing success plus great discounts on Kombucha Kamp’s custom made brewing upgrades. As with each of the Continuous Brew packages, Kombucha Kamp sets you up for success with a library of resource materials at your fingertips. The Kombucha Mamma takes you on the journey of successful home brewing through the Set Up & EZ UpKeep Videos and the 100+ page Complete Guide pdf provides details, flavoring recipes and brewing tips in an easy to use format with a clickable table of contents. Even if new to fermentation or an old hand, this kit will make the process fun and successful! Videos, Guide, Complete Brewing Supplies and Full Support all included! To choose JUN Tea for your Continuous Brew package, use the first drop down menu option and change from Kombucha to JUN. Ferment Friend w/Thermostat (KKAMP EXCLUSIVE!) - $150 Value - SAVE BIG $40 OFF! - Just $109!! The Imported vessels are made in China of certified lead free porcelain. The spigot is made of PP5 - the highest quality plastic designed to be corrosion resistant. This plastic is also used in beer & wine brewing. The capacity is 2.5 gallons - perfect for drawing up to a gallon of Kombucha a week or 1/2 a gallon every few days. The vessel measures 10" tall and is 17" tall on the stand and is 12" wide. The fine finish wood stands are imported from China. Easy to construct, they provide 7" of height to the brewing vessel. 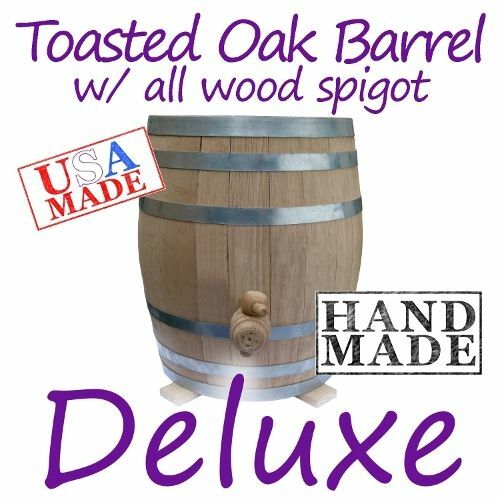 The USA made spigot makes dispensing KT by the glass or the bottle a breeze & clean up a snap. Free Shipping is not available to international destinations. This system was so easy to set up, and it looks just beautiful! I brewed my first batch a couple of weeks ago using the instructions from the Complete Handbook, and it was so easy! My batch isn't quite ready yet, but I can't wait to use some of the special flavorings I purchased to go with it! I will definitely be coming back to Kombucha Kamp for all my kombucha needs! I normally do not leave reviews.. BUT.. this is an exception! Hannah gives EXCELLENT customer service! (which is rare these days).. If you are clueless or intimidated.... TRUST ME...Hannah's complete and deluxe packages are the way to go... effortless... all videos and her handbook are simple easy and through. She is always there for questions and concerns...and she actually cares.. After I got my continuous brew up and going... I did end up getting a heat strip... which was a wise choice for controlling the temp... and I have topped off additional gallon of tea to my vessel... I truly have continuous brew.. it is wonderful... I already see a difference in my gut health... digestion... and am so excited... I gifted my eldest daughter with a complete package.. My grandchild LOVES kombucha!!! I HIGHLY RECOMMEND KOMBUCHA KAMP. Always remember, you get what you pay for... yeah you could piece this all together... but.. you miss out on all the EXPERTISE!! Which is priceless in my opinion.. Thank you Hannah & team... Happy Brewing everyone!! I never considered the possibility of brewing my own kombucha until I moved to a different state, 7 hours away from my favorite local craft kombucha brewery. I’m not one for messes or more hassle than necessary, so I didn’t even consider attempting to batch brew before jumping into a continuous brewing system. I admittedly spent several weeks shopping around before I took the plunge, but I’m so glad I did! The upfront investment might seem like a lot, but depending on how much kombucha you and your family consume, you’ll more than make up for the cost of this system within a few months or less. Again, with simplicity and quality in mind, I added the Ferment Friend which is AMAZING! I had ordered The Big Book of Kombucha on Amazon prior to purchasing this package, so I’d definitely recommend adding that. It will be your kombucha bible. I wish I would have added on additional Brewer caps or the brewer tee set, so that will likely be my next purchase. Hope this helps in your purchasing decision! I recommend buying the book and reading it cover to cover - using lots of post-it notes in spots to repeatedly refer to. Then order one of the complete continuous brew packages with the Ferment Friend with Thermostat heater- that lets you set it and forget it. While your order is winging its way to you, watch the set-up videos. I found it helpful to see the process, and got a great problem solving tip for my leaky spigot- attach the plastic screw/washer backwards. After only a month I still have very little experience under my belt, but my efforts are directed toward tasting and smelling and observing my brew, and not in stumbling in and and out of pitfalls. The book and the kit really do make it foolproof...and tasty! For a long time I felt like I was splurging buying Kombucha on a regular basis. I started researching and talking to people about brewing my own. Several times I was told to check out Kombucha Kamp and The Big Book of Kombucha and that all of my questions would be answered. They were right! I knew I wanted to try to brew my own. When I looked into these kits I thought it was more than I wanted to initially invest and started looking at other options. In the long run buying a little here and a little there and "maybe" it would work didn't seem like a bargain. I purchased the kit and it all came together packaged very nicely. The how to and set up videos were extremely helpful and I referred to them a couple of times. I was up and brewing that same evening! It was important to be successful and this is the best way to start. I absolutely love it! My next big investment will have to be the handmade stoneware brewing vessel! Wishing it would be possible to give this product 10 stars. I am absolutely delighted to have found this kit (I also bought the heating belt, as we live in a colder climate) and highly recommend it. It is great to have control of the ingredients and knowing that the brewer contains no metal pieces. The book is a great resource too. Thank you for your passion to bring health to so many people with such a user-friendly system! Wow, I wish I would have ordered this much sooner! My continuous brew system is much faster, less mess, and much easier than using the gallon jar method. Highly recommend! I love my CB kit. Easy to follow steps for both setup and brewing. 20 days in, and my first batch tastes fantastic! 5/5 stars! So far, I have had a successful experience with the continuous brewing procedure. Using the videos provided and reading the "KT bible" I have been enjoying my very own home brewed booch. Though am still learning to flavor and increasing the carbonation of the secondary fermentation process. The only quasi disaster encountered was during the initial brewing. It was the result of not filling the brewer with more water for testing the spigot gaskets so when the first gallon of sweet tea was poured into brewer a leak around the gasket was discovered. The leak was remedied by reversing gasket placement (placing beveled sides of gaskets onto the spigot port of the brewer). I give KKamp 5 Stars for this equipment and the support available. The continuous brew kit is everything you need to start making delicious kombucha. I had tried to make kombucha before with a scoby from a friend but I lacked the knowledge and resources on how to make it successfully. I am really grateful to have found Kombucha Kamp. I recommend buying the kit to anyone who is obsessed with kombucha (like me). I can not tell you how pleased I am with my continuous brewer! I bought it due to the inflammation that I experience with my M.S. and wow does it work. The ease of keeping the pot healthy and going is wonderful. I am sold! I'm in in for the long haul! Healthy gut, healthy life, just healthy! I'm fairly new to Kombucha, but as soon as I tried it, I knew I needed it in my life! Store bought is good, but gets spendy. I researched making my own and discovered Kombucha Kamp. I thought I might be getting in over my head with a continuous brew system, but I am so glad that is what I started with. The kit contains everything I needed and Hannah's videos and the pdf booklet make the process easy (I also have the Big Book of Kombucha which is an awesome resource!). I've only completed my first brew and have just added my top off tea, and everything is going great! The scobys are beautiful, Hannah's special blend tea makes a very tasty brew (and is great as a brewed tea to drink! ), and the 2nd fermentation recipes that I've tried so far have been better than store bought. I'm reusing GT bottles for my 2nd fermentation, and I think I do need to get the replacement caps offered by Kombucha Kamp to get better fizz, but I am so happy to have my continuous brew system! Thank you! I got the continuous brew package in porcelain and couldn't be happier with it! I upgraded the spigot and also purchased the Ferment Friend heater. I highly recommend both upgrades! Do it right the first time around and make it easy on yourself. I purchased the Continuous Brew system and currently have my 4th batch brewing. Even though my husband was skeptical at first he has started to, at least, drink a glass each morning before he heads off to work. I, on the other hand, have been thoroughly enjoying the regularity that the KT has brought to my system. I drank my first batch without flavoring...my 2nd batch I flavored with strawberries, nectarines, and mint (all in separate bottles). My 3rd batch was apple/cinnamon (and is currently my favorite). It was funny that my husband thought I had added sugar to the tea after it was flavored as it tasted so sweet to him. I love that the CB system allows for it to just percolate, the heat strip keeps it at the right temperature, and everything smells and looks healthy. The continuous brew setup from Kombucha Kamp is wonderful. Comes with everything you need (I opted for ordering a heater as ND is super chilly in the winter) and it's so easy it's ridiculous. Setup took a little time as I was paranoid about contaminating the brew but that's on me. For a full time working mom with two little boys to take care of that love kombucha (and a mom that doesn't like the overly sweet taste of bottled kombucha at the store), this is a wonderful set. I'll be buying another set as this kombucha is awesome. Make sure to get Hannah's book! It's a lifesaver! Also-the videos that came with the package make things super easy to understand-they're super helpful! First let me say this is the best company. I just received the complete continuous brew package. The package is great. Comes with everything I need to go from single batch brewing to continuous brewing. Thank you for your wonderful customer service. My fiancé and I got tired of spending so much money on KT in the grocery store, so we decided to invest in a continuous brew kit. We upgraded to add a stainless steel spout and added the top of the line thermometer. Well worth the money, in our opinion. It'll easily pay for itself in only 5 top-offs. And we get to experiment with flavors! So far, ginger hibiscus lime, and ginger hibiscus blueberry lime are our favorites. We're grateful for the awesome scobys, info, and the ability to brew our own KT! I ordered the Complete brewing package. I love it! This gets 5 stars. As you said, this is the easiest and very efficient way to brew. This is one of the best investments I've made. Finally I purchased the heater with the dimmer switch. The purpose was to keep the brew at optimal temperature. It does that very well - another good investment. This gets 5 stars! Thank you! Thank you! I was introduced to Kombucha about 8 months ago. I love it, but it's quite expensive buying it at the store so I decided to try to brew it. I didn't know about kombucha Kamp at that time so I read about batch brewing on the internet and got the supplies elsewhere and made some batch brews. It took some trial and error but I got it down. However, after more research I finally found kombucha kamp and now I had a real resource! I was so excited because I had grown to love it so much but was, really, just winging it. Once I read up on the continuous brew method I knew this was the method for me. Batch brewing has too many steps and just takes too long. The continuous brew method is way easier. Now I can continuously brew it and keep up with my consumption. It's just my husband and me, but I love it so much that I drink plenty! And, by the way, I love what I brew so much more than the store bought kind. And the best part is the resource for information and quality ingredients. So, so glad I found them!! Love Love Love it!!! I am addicted to kombucha and it has been so easy to make my own. Thank you Hannah for all of your knowledge and such easy to follow instructions. I am ready to order another CB package. I've had my continuous brew system for about 4 months now, and this is, hands down, THE BEST way to brew kombucha! Once a week I decant 3-4 liter bottles of consistently delicious KT and top off the brewer with 1- 1.5 gallons of sweet tea. It takes less than 30 minutes and that includes adding flavorings to the bottles for a second ferment. I'll never go back to the gallon jar method. I also purchased the heating system with dimmer, but the one I received was faulty. I contacted customer service, and they sent a new one at no charge. The new heater is working flawlessly -- which is a good thing as we're approaching winter here in Michigan. I highly recommend the continuous brewing system and the heater and especially Kombucha Kamp. I'm a very satisfied customer! 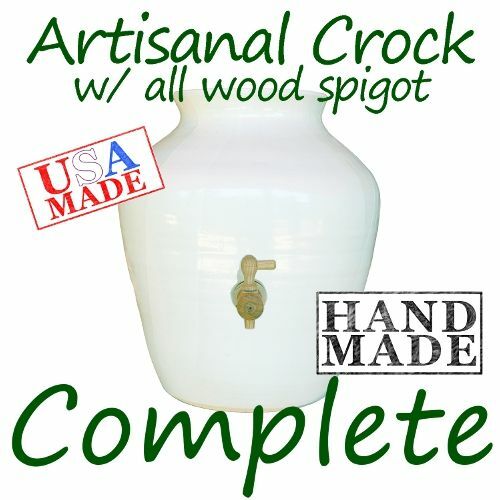 I purchased the Complete Package (porcelain vessel, stainless steel spigot) - I give it 5 stars. The videos made making my initial brew so easy!! Each of my orders shipped quickly and well packaged. Kombucha Mama/Kombucha Kamp gets 5 stars for quality products, quality service, and quality support! I am finding my kombucha rhythm! I bought the continuous brew package because I had purchased enough kombucha to know that I would be a serious brewer. All the information that comes with the package plus the Big Book of Kombucha makes it easy to set up and answers any questions for those of us who are insecure every step of the way. The basic heating strip has been keeping the vessel at a desired temperature during this fall heating season when my house's temperature fluctuates. I purchased pH tape 0 - 6 because I could see I would run out of strips and I am being scientific in addition to being an eager taster. Thank you so much for making a great experience possible. I love my CB brewer!! Have had it only about a month and am continuing to learn about the process of making Kombucha Tea. Great videos and written instructions are a very big help to me. I had downloaded the Big Book of Kombucha before I ordered my brewer. I now have gotten the hard copy to enjoy. Love it!! Looking forward to brewing Kombucha Tea for a long time. Glad to have Kombucha Kamp as my go to for info and quality products. We've been drinking kombucha for about a year now and just love everything about it but the price at the store. I started looking into making it myself and found this to be the best, easiest way for me to get started. Its so easy I am so happy with having been able to buy everything and have it be such high quality. My brew tasts great! Thank you for being out there for all of us. I was overwhelmed by the idea of starting a CB kombucha but after reading a lot of helpful information on Hannah's website, I decided to give it a try. I am very pleased with their customer service, the product and with all the information they provide to help you succeed. Will definitely recommend to my friends. My Kombucha beginning ...it all started out drinking GT's kombucha by the bottle, and then the case...soon to be an expensive habit. A friend of mine was making Komboucha by the gallon and insisted that I make it at home to save money. Next thing I know I have a Scoby and a recipe. My first batch was great , but it was not enough to keep up with my consumption. My search began for more information and that's when I found Kombucha Kamp. Figuring out the cost of Kombucha in the store versus a continuous brew package, I knew I could save money in the long run. I bought the hole kit and caboodle including the "Big Book of Kombucha". I bought the kit and have to admit I was a little nervous how this would work...BUT found out it was easy and after 4 weeks my first batch is amazing. Love it. Discovering Kombucha and Kombucha Mamma has been a god send. All of her products are top of the line. There is not just one thing to rate. Because it's all fantastic. And Hannah is a delight. Every time I've ordered its been by phone, and she's always polite. By the way if you have not purchased her book (The Big Book of Kombucha) you really should. Worth every dollar. Thanks Hannah!! You are the best. This is the easiest way to make slammin' kombucha I have ever seen! Even if you are a stranger to fermentation--or to your kitchen in general :)--this can be done without frustration with this system. Hannah's tea blend is also easy and excellent! Ok, I'm completely sold on this! I had been fermenting other foods for quite a while, and occasionally buying a bottle of kombucha here and there, not quite sure if I'd like it enough to take the plunge and buy equipment. Eventually I called KKamp to ask more questions. Hannah answered the phone and we had a good conversation. She knowledgeably answered all questions and I placed the order in January. So glad I did! The equipment - porcelain brewer, stainless spigot, and heater with dimmer switch are top quality. Hannah's blend tea is delicious, as is the brain brew blend. The process of set up and continuous brew is easier than I thought it would be, and keeping a brew log has been helpful in the learning process. It was a nice surprise to discover that we love the homemade brew so much more than store bought, especially warm straight from the tap. I am very pleased with the products, and the service has been stellar; prompt, accurate, courteous, and helpful. I expect to be a regular customer. I absolutely love the set up, the ease of use, the taste, the simplicity, and most of all I am not spending $4 a day on store bought kombucha. I absolutely love it and honestly am contemplating purchasing another Brewer to brew for friends and family. Thank you so much for making everything so available to us new Brewers!! I ordered the complete brewing package one 01-29-16 and by 02-06-16 I had my first batch of kombucha brewing. I must say I was really intimidated, but it turned out to be easy. I received only one washer with the spigot, I sent an email to Hanna and it was sent out the next day, tree ally fast customer service! I love it. As of yesterday I am second fermenting four bottles of booth and topped off my CB with a second batch. I am so excited! I just ordered Milk Kefir grains and I can't wait to get started with that also, I'm lactose intolerant but reading so much about it I'm willing to try it, if that doesn't work I'll use nut milk. I'm loving Kombucha Kamp and Hanna Crum. I bought a kombucha kit ( just a dehydrated scoby ) and was scared to use it , so I went back on the Internet and saw Kombucha Kamp and watched a few videos on You Tube and was hooked. I'll be buying all of my products from Hanna and Kombucha Kamp. Next purchase will be Water Kefir grains I r maybe the Jun culture, not sure yet. I would recommend Kombucha Kamp to anyone interested in fermented drinks and good health. Right now I have a really bad digestive problem and with the help of kombucha milk and water Kefir and cultured foods I'm looking forward to better health. Here's to good health toall. So grateful I found your site! Purchased the continuous brewer & heat strip. So thrilled with how easy it is & have been getting awesome booch since! Can't imagine being without this system for the convenience & health benefits! Since starting this journey I have also purchased Hannah's Special tea blend & many of the flavourings....always fresh, well packaged & arrived quickly! I purchased the Modern Porcelain Continuous Brewer Complete Package w/the Ferment Friend Heater with Thermostat. I am thrilled with every product included in the package & your customer support! Initially my heater had a defective switch, and all it took was an email from me & you took care of everything, no questions, no hassle, just superior customer service. All of the information you provide makes the process approachable and easy to have confidence in. Because of your commitment to and love of brewing kombucha you are helping so many people to benefit from your experience. Thank you! I am enjoying my tasty brew daily immensely! I don't seem to be able to get any fizz on my second ferment, but it’s still tasty! I have and will continue to recommended Kombucha Kamp to my friends who are interested in brewing their own delicious tea. On all counts I give Kombucha Kamp 5 out of 5 Stars and will be a regular customer as I explore this fantastic brewing process. We love the continuous brew package. I wanted to be successful from the get go, and this package proved to be perfect. My family really enjoys the taste of buch straight out of the brewer, without the flavoring. My husband doesn't care for the commercial Kombucha, but he loves the light flavor of our homemade brew. So happy with our purchase, and my husband keeps asking me why I didn't buy the 5 gallon brewer. Time for an upgrade already? If you're hesitating to take the Kombucha leap ... do not hesitate. Hannah has it all figured out to turn a complete novice into a great brewer. I was very impressed with the complete package. Everything is quality and Hannah makes it so easy to understand, so you can't go wrong. I am enjoying a daily glass of unflavored kombucha (which I prefer), but it's so very easy to flavor and fizz to try different fruits and berries or flavorings. It's a very clean looking set up and the elastic bonnet cap works perfectly to protect and breathe. Shipping was fast and secure and included everything I needed. Thank you so much Hannah! My first experience with making Kombucha (single brew method) was a few months ago when my daughter ordered a SCOBY from Kombucha Kamp--- and then gave it to me!! As a newbie, I had NO IDEA what I was doing! I started by researching on-line and (thankfully!) stumbled upon Kombucha Kamp’s website. Thanks to Hannah and the THOROUGH information she presents, it cleared up the many questions, confusion, and fear. Hannah REALLY knows her stuff!! After several weeks of single batch brewing “under my belt”,gaining a little confidence, in addition to learning more about the Kombucha making process, I decided it was time for me to "upgrade" to continuous brew. 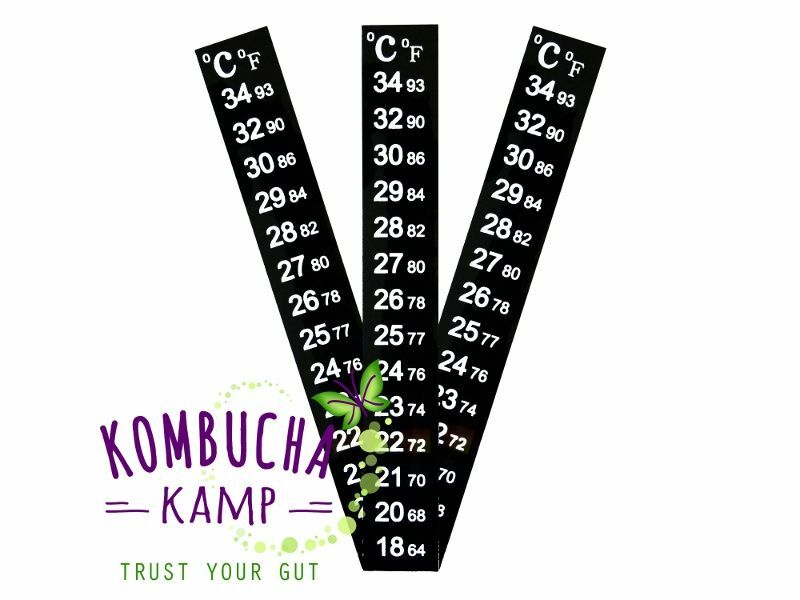 I've recently purchased a continuous brew system from Kombucha Kamp and am so glad that I did! I love this method, I find it’s SO much easier for me! In addition, when single batch brewing Kombucha, I was a little nervous about handling the SCOBY with each batch that I’d make. I’m happy not to have to deal with that now. And I particularly love being able to dispense directly from the brewer into bottles – a real time-saver! I am just SO PLEASED with everything I've purchased - the variety and quality of the products, the 2nd brew flavorings, etc., and will continue to order from Kombucha Kamp in the future. I feel Kombucha Kamp truly cares about taking care of their customers, providing them with excellent service. Everything is just as promised. My package arrived in a timely fashion. The assembly and set-up instructions were very clear. 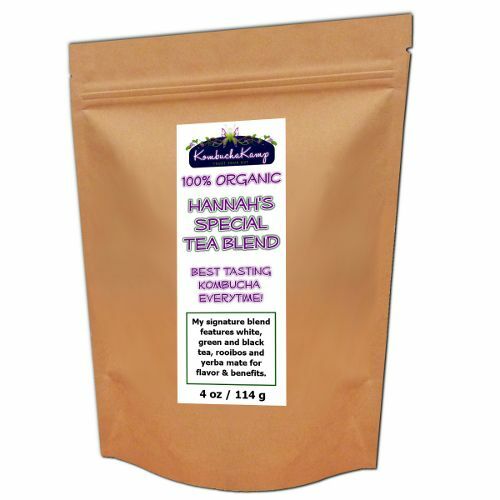 The taste of Hannah's tea blend is absolutely amazing, as are all the additional 2nd brew flavorings that I ordered. I can’t say that I have a favorite – I like them all!! And I like the different health benefits derived from each! As I said, all of the products I've tried so far have been totally amazing! Beyond my expectations! I am hooked - and am spreading the word to family members and friends!! Thank you Hannah and Kombucha Kamp!! After searching around on the web for information on kombucha, I found Hannah's Kombucha Kamp site. Read thru all the information there, mulled over whether to batch or continuous brew, and ultimately decided on the continuous brew. I called to place my order for the CB package, and I received all the necessary ingredients to begin the continuous brewing process. I would whole heartedly recommend Hannah, and her company, as they are always there to help when needed. Even checking up to see how my venture into CB was going and if I had any questions so far. Their customer service ensures you will have great success in your kombucha brewing, whether batch or continuous. I just got your presents! Thank you! I am really excited to start brewing and your gifts are going to make the experience so much better. You are the best! Thank you. I can't think of a single thing negative to say about this product. High-quality, loads of instructions and I'm drinking the best damn Kombucha I've ever made right NOW! I can't believe I went through such a process every week when it's so easy this way. The pdf book that comes with the brewer is very detailed. AWESOME! SO EASY TO USE. I BROUGHT MY COUSIN ONE ALSO AND SHE LOVESSSS IT. I flavor my tea with hibiscus and it really lowers the blood pressure fast! great stuff! I got my continuous brewer and I love it. Have made three batches and left one for two weeks while on vacation. Took bottles with and was so good. Came home and bottled more and filled it up and is brewing. My great granddaughters love it and giving it away to friends. I got my neighbor making it. I wish more people would get into making it. So good for kids . They love the second brew because they think it is soda. Surprise it is not and so good for them. Thanks a lot. I started drinking GTS brand Raw Organic Kombucha about 6 months ago and fell in love with it. I especially love the Gingeraid flavor. I've been having fun with my Complete Kit that I purchased. I have to say that I was a little disappointed to find Styrofoam packing in the package since there is cellulose popcorn available that is easily dissolved and flushed down the drain or thrown in the composter. Other than that the kit arrived in perfect condition and I have been making my own Kombucha. It is so much cheaper than buying it every day at the store and quite honestly my Kombucha tastes as good as the GTS brand. I'm not getting quite enough to satisfy me yet, but my scoby looks healthy and is growing so I'm anticipating a higher yield as time passes. I am also looking forward to more fizz. I am drinking it fast so I haven't been able to leave it alone, after bottling, long enough for a real fizz to develop. All in all I'm enjoying the process and the black ceramic looks great in my kitchen since I have all stainless steel and black appliances. Thanks for a great product. Thanks too for the knowledge you bring to this process. I've now topped off my brewer about 4 times and have accomplished making a buch that is as good as my favorite -- Revive's Lemon Kombucha - which also costs many dollars! Thanks to your attention to detail and support, my freakouts were minimal as I watched your videos and did what you did. And then waited. And it worked and keeps working. I feel great. I feel successful and financially savvy for figuring out how to produce this myself. I figure I'll pay off my investment in 4 months, Hannah! We purchased the COMPLETE continuous brew package from the Kombucha Kamp store in early January. We are a family of 6 who became interested in home brewing our own Kombucha because everyone loves kombucha and would drink it every day if they could. At $3 to $4 a bottle, the cost of doing this becomes a rather expensive exercise. As someone with an auto-immune condition (Crohn’s Disease) where gut health is essential, I consider kombucha part of my medical therapy. So, I did some reading about how to do it yourself to see if it was worth trying. At first, I was concerned about safety, hassle and difficulty of brewing. However, I decided to give it a try nonetheless. The first thing I tried was a cheap kit from an online retailer (not kombucha kamp!) that I purchased as a Christmas gift for my wife. We followed the directions, gave it a try - and promptly got mold (couldn’t control the temperature and the SCOBY wasn’t healthy). So the cheap route just didn’t work. I decided to invest in a kit from Kombucha Kamp. After reading online and digging around, we settled on the COMPLETE continuous brew package with a heater wrap to try again. I should have done that in the first place! This kit comes with all of the supplies you need to control the fermentation environment and this has made all the difference. The SCOBY is growing beautifully, the tea is brewing perfectly and we have now made a total of 20 bottles of berry/ginger flavored kombucha during 2nd fermentation (though I won’t lie - I enjoy it just as much straight from the tap). So, with respect to this product - I would highly recommend investing the money in a system like this. It comes with everything you need, the documentation and instruction materials are first rate, and the supplies and customer service are excellent! I am very pleased with this product. I am simply over the Moon for this system. I had tried KT 20 years ago and it was a huge pain. This is so simple and Hannah is so wonderful to answer all your questions at any time. I love the ease with which I can make my own KT, saving so much because my boyfriend and I each drink at least a 16 oz bottle a day. It was easy to set up, easy to begin brewing and easy to make more without all the hassle of batch brew. The crock is GORGEOUS! It looks so nice on my counter and it's so easy to fill the bottles when it comes time to make my second fermentation. I have had so much fun trying new flavors and am finally getting the hang of getting more carbonation. We've done Cherries, blueberries, matcha green tea, ginger, goji berries and ginger (very fizzy!) honeyed mango and maca root powder, the last two of which I'm waiting to try in a couple of days. Hannah was right. You do get your Groove On after a few batches. I'M IN LOVE!!!!!!! Thank You Kombucha Mamma for all your hard work and research that makes it so easy for the rest of us to benefit from your knowledge and expertise. You are Golden! A word to the wise...It may be time consuming but I read ALL the reviews on EVERYTHING. That is why I chose KK. Not only did I find how many people are just like me, learning a new, healthy habit but I also learned 5-6 new tips I would have never known if I hadn't read ALL the reviews. I learned new flavors, tips and tricks from other brewers. This includes ALL reviews on this site. Take advantage of others imagination and ideas to boost your own creativity and get your Brew On! Have been brewing for a month......love my booch.....and the brewing system is so easy.....years ago I did the kombucha tea but had gotten mold and had to throw all away and had not gotten any more scobys.......and the whole process had gotten overwhelming with all the bowls and jars and no instructions with any of it......so that being said....this is a breeze now....have the brewer and INSTRUCTIONS!!....YAY!!! Love my KT and so easy this time around!! Thank you, thank you, thank you!! I have recommended the booch and will keep on recommending. So I fell in love with GTs Kombucha but I quickly realized that drinking even one bottle a day was going to get very expensive. I was very intimidated by the idea of brewing my own Kombucha. Especially figuring out all of the different little things I would need to buy. When I found Hannah's kits I started thinking maybe I could do it. The Complete package had everything I needed and I got to try one of her flavorings which was awesome. I live in Southern California so I just got the essential heat strip which works like a charm! After my second brew cycle I was feeling pretty confident. Now two months later I feel like an experienced brewer...it was that easy thanks to Hannah!I would definitely recommend the complete brew package to make your beginning brewing easy and smooth. I was so thankful I got this package because it had everything I needed to make my first batch of kombucha.I had never made it before so I was somewhat uneasy but between the printed and video material I was able to make a fantastic batch of kombucha. I subsequently made a second batch and it was even better than the first and I have a nice new Scoby beginning to grow on the surface. It tastes great and has a wonderful natural effervescence. The first home brewed kombucha I had was made by my sister who always added fruit juice to it. I like this kombucha even without adding flavoring or fruit juice. The nice thing about the package everything was there that I needed it so I felt very comfortable about doing it.I had some questions when I was placing my order so I called and just happened to get Hannah on the phone. She was extremely helpful and so nice! I wondered if I needed a heater since I lived near Jacksonville Florida and since we keep our house around 72 to 74 degrees she said I did not need one. Even though it's been cold out the Kombucha has been doing fine without the heater. Everything came exactly as it was supposed to be shipped. I am a great proponent of the continuous brewing method. My sister does the batch brewing and this is much easier. I would recommend this product in this company to anyone. Don't be afraid to start off with continuous brewing. I was also glad I got the t-shirt for the crock with the matching lid. It's beautiful and helps keep it insulated. I stuck the temperature strip right under the opening so I can easily check the temperature. I also write the date I fed it on a piece of masking tape under the t-shirt. I was petrified by the whole brewing process but the kit and the videos took the worry out and I am drinking Kombucha daily and sharing it with my friends. I teach Kindergarten theough 3rd grade Special Ed and every year I get a devastating Bug....this year I fought it off longer but I did succumb only I made it through without antibiotics thanks to the Kombucha benefits. My colleagues are suffering miserably. I am comfortable with the continuous brew system. It has become simple and worry free. I am looking forward to experimenting with more flavors....so far my favorite is ginger and lime. Thanks for taking the worry out of this process. I am very pleased with my continuous brew system! So pleased, in fact, that I bought a second one! With all the information given with your purchase, it makes starting and maintaining your brew so much easier than I had anticipated! The taste of the tea is fabulous! I use Hannah's Special Tea Blend. I ordered different flavors to try, and do like them, but my favorite way to drink it is right out of spout! I did have an issue with the second brewer I ordered, but Hannah sent a replacement. I do recommend buying from KombuchaKamp!She makes it so easy, the scobies are healthy, the tea tastes great, and you can email customer service with questions any time you need. Great product! Great Service! Great Information! Everything added up to a GREAT experience. I am new to brewing kombucha, so I did a lot of reading, and watched a lot of videos about the process in order to gain the confidence that I could do this. I decided to purchase the Continuous Brew Crock because of the great reviews. I am so glad I did! I started my very first brew on October 01,2014, and everything is going perfectly thanks to all of the great advice and videos on this site. In addition the customer service is outstanding. I will not hesitate to recommend KombuchaKamp. I recently started my continuos brew, and I couldn't be happier!! Hannah was extremely helpful, and her videos make set up a breeze. I am well on my way to making delicious Kombucha, and I am so glad I went with this company to start my project! This is a very impressive setup; Hannah thought of everything -- and I mean everything! I successfully have completed one cycle of brew and am close to completing my second batch. Since enjoying my first batch I am convinced that Hannah's blend of tea made THE best KT I've ever had; I was surprised at how sparkly and clean it tasted and that I liked it more than the popular (and expensive) brand I had been buying at the store. A couple components were defective however I received prompt attention and the components were replaced within the week. Being almost brand new to brewing any KT in the first place I was a nervous wreck but Hanna gave me encouraging words which I really appreciated; it was very nice having personalized attention. However because of the initial equipment problems I deducted one star; it was probably just a fluke however it was disappointing to me. Like you, I was tired of the ridiculous retail prices of Kombucha at the store. Well, not only am I thrilled to report that I no longer buy at the store, I am an official Kombucha Kamp home-brewer and don' think I could be more thrilled. I love my CB system - and it's only been about 6 weeks! If you are interested in trying this (the hardest part really is learning HOW and WHAT to do, but once you've got that down it's smooth sailing!) then I'd highly recommend you take the plunge -- and Kombucha Kamp is the place to do it! You get everything you need to start with this CB kit and as the other reviews will tell you, it comes packaged very well and the videos are so clear on how to start! It really is as simple as brewing sweet-tea once you get it started. Easy AND delicious...all for a fraction of what you'd pay at the store. I actually like this better than the store, and my husband, who wouldn't drink KT at all before, actually does now! I also really love the special touches that come with this system... the fabric lid cap (that fits perfectly and you get to choose a color!) and the ability to upgrade to USA-made crock are benefits for sure. And did I mention it's delicious?! My 'new thing' is to treat my friends to Kombucha Tastings of all the new flavors I create in the 2nd fermentation process --but it's so good straight from the tap! Once I got up and running, I spend less than an hour a week bottling, brewing tea and creating my flavors with this system and have LOADS of KT to enjoy throughout the week. And I have fun doing it, too! When people ask what I did this summer, I say "I went to Kamp --- Kombucha Kamp! Wanna try my new flavor________?" If you're thinking about trying the CB system, I wouldn't hesitate if you already like KT a lot. You could easily do a simple, single batch brew and be fine... but if know you already like KT, then GOT FOR IT with the CB System because, like me, after you get it going, you're going to love it even more! My family is getting so much enjoyment out of our continuous brewer. Everything came packaged so neatly, with clear instructions. I have had my kit for about a month and have been making some of the most delicious KT. We drink straight from the tap, as well as bottle a few so that we can add flavor and get that extra fizz. The tea that comes with the kit is extraordinary! I am thrilled with the Continuous Brewer! Just sitting here having a lovely glass of booch from the brewer you sent me July 18 and thought I\'d drop you a note to say how fantastic it is! Think I\'ll like it a little tarter, but it tastes lovely today, and brewing couldn\'t be easier. Thanks so much! I'm loving the continuous brew kombucha! Thank you very much for making it so easy to begin. Your kit, instructions and set-up videos were extremely helpful and you make beginning kombucha brewing very enjoyable. I had been batch brewing for 2 years but due to temperature constraints was able to enjoy a continuous supply of KT for only a few months out of the year (unless I wanted to shell out over $3.00 a bottle) I also found that batch brewing was kind of messy and with the constant handling of the SCOBY I was always in need of a fresh one. When I was getting ready to make the SCOBY for this year I read about the reformulation of the commercial KT and how that affects the quality of the SCOBY. In looking over Hanna’s web site the dimmer system heater caught my attention. 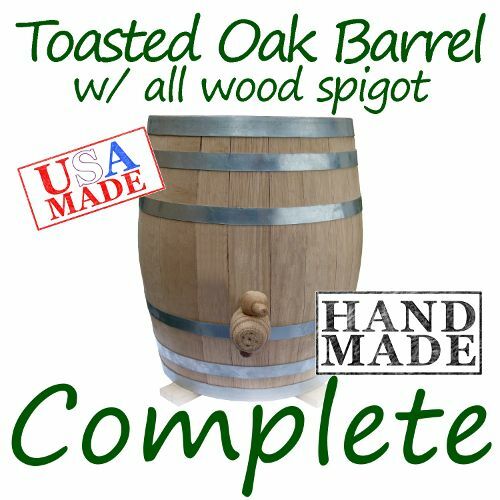 Now there was a way to brew all year and with the spigot there is no mess. Really, it doesn’t get any easier. If I want to flavor or carbonate with a 2nd fermentation I bottle from the fermenter. If I want unflavored KT I drink straight from the fermenter. After drawing off a gallon I add a gallon of sweet tea. If a gallon is too much for a week (yeah, that might happen) this is so easy and inexpensive to make you just pour a little down the drain. As for the package you get, the vessel is nice, it won’t detract from the area you keep it. The legs are kind of cheap, not well manufactured. The cotton top fits well. The dimmer heater is VERY sensitive. Figure out how to use it in the summer when the temperature of your tea won’t go below your desired temperature. Start with a low setting and turn it up just a little until you find the right temperature, A little turn can go a long way. Overall I am very happy with the purchase. Delivery was on a Friday, I set it up on a Saturday and was drinking my KT the next Saturday. My kit arrived today and everything is set up and going! When I unpacked I knew exactly what to do with everything in the box…including sample a gogi berry because they looked so good!!! You have made this start-up process as simple as it could possibly be. 7 days can’t come soon enough!! I absolutely love my kombucha CB kit. The only complaint is that I haven't been able to bottle any yet to share with family and friends. My gut problem was much better within the first few weeks of drinking a glassful every day. My 17 year old cat also enjoys a few drops on his meat and his health issues seem to have cleared up. The heating element has been a huge plus here in the cold weather in Canada. The whole CB set-up looks so elegant on my dining room sideboard and has drawn comments from friends who have visited. So a big thank you goes to you Hannah, for providing such a wonderful user-friendly product. Yes! The new crock arrived yesterday...UNBROKEN. It is beautiful and my husband and I are setting it up today. I did put our Scobies in a hotel to hang out while waiting for their permanent home. I even have a new baby! I ordered the continuous brewer complete package and found the videos and instructions very helpful. The quality of the stand could be improved, but that is only a minor detail. I was nervous about getting started, but the process was easy with all the support materials. Just bottled several bottles and snuck a taste - it was delicious. I have been purchasing kombucha, and feel that making my own will be better in many ways - convenience, expense and taste....not to mention the fun I am having making it. Really appreciate the excellent customer service. This is a great package -just right for a first-time brewer. The quality of the products including the SCOBY is what I expected. The tea blend is very nice and I like it better than some other teas I've tried. 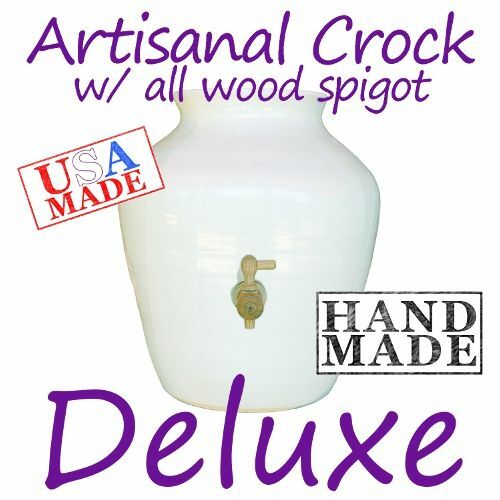 My vessel was shipped without the spigot, but a replacement was shipped immediately and I had it in a few days. The video instructions are very detailed and easy to follow. You won't be disappointed. The scobys and box of supplies came first. By then I had already downloaded the ebook, read it, and watched the videos. Very much worth the time and money. Almost everything you could think of to ask about setting up is right there. The scobies were packed very securely and they were just fine. A few days later, the brewer arrived. We set it up and we've already bottled twice. My daughter and I are really enjoying the whole process. (And the KT!) My only regret is that I didn't get the package with the heater. It's going on my wish list. Wow, finally success at Kumbucha!! I wasted almost this much money trying to buy scabies at the health store and starting over, starting over, starting over. After talking on the phone with ONE EXCELLENT HELPER, we determined heat was probably the issue. Sure enough, right out of the gate, one week after purchase we had kombucha. We are hooked. I couldn't get the videos to work but it might be slow internet. However, the link to the book saved the day. Lots of support if needed and we are delighted with everything. have been resolved, so we can give the brewer a rating of 5 stars. Am so excited got the order put it all together and now it is waiting to do it's thing for seven days. Video's and E=mails are very helpful. You have done a great job of putting everything together so even wee little brains like mine can do it. I called Hannah because I had a difficult time viewing, due to poor eyesight , the delineations on the option for purchasing a continuous brewing . She patiently explained the systems. She linked me up to the instruction book directly. I ordered one. It arrived fast, in 3 days. Then, I had a difficult time getting the instruction videos to play continuously. I emailed the Kombucha Kamp . They emailed back within the hour, I tried what they said and , it still didn't work. They deferred to Hannah. She actually called me at 8 PM at night to lead me through it. Then, a follow up email the next day. I read the book. I have had perfect Kombucha for several months now. The taste and lightness of her blend are very satifying agreeable to the palate. The elderberries she sent as a second fermentation option are exquisite. I tried Black tea alone and it is heavier and not as complex and flavorful as Hannah's Special Tea Blend. I'm ready to order some more Hannahs Special Tea Blend and new flavor options. Thanks for a healthful , yummy , satisfying drink that is so easy and FUN to make. I don't have kids at home anymore ...no more empty nest syndrome... now I take care of my Scoby's !!! I've really enjoyed making my own kombucha with my continuous brewer kit. Buying the complete kit gave me everything I needed to get started brewing as soon as I opened the package, and the instructions and videos are clear and easy to follow. The most difficult thing about the whole process was waiting for the booch to be ready to bottle and drink. Received my Complete Continuous brewer order with great easy to follow instructions so fast! The scoby's were nice and thick and my first batch was ready in 1 week. Tastes so darn good! Love the continuous brewer, it's so easy...just adding more brewed tea to keep the booch coming with out all the added work is great since I don't have the time to bother with juggling jars and making fresh batches each time. I was a little nervous at first, but after viewing Hannah's step by step how to videos I jumped right in. So glad I decided to purchase from Kombucha Kamp. I have not found any from other sources that approach your guidance, soda flavors, nor the wonderful scobys (I talk to them also!). I have lost nearly 40 lbs in awful fat, feel sooo great - all to the fun of culturing and consumption of my booch! Kombucha really depresses my craving for sugar - and you have made its culturing so simple! Last night, I opened a bottle of lemon-ginger soda that I had flavored in November (stored in refrig after a 3-day incubation at room temp) - well, I do not know if 'it gets any better than that" - the head on the soda was overflowing, crystal clear, and of such an ambrosia-like, smoothness and flavor that I consumed the entire 12-oz bottle while watching the national football championship game. The soda was such a delicious and nutritious alternative to Busch Lite! I thought that the soda would be too old to be good, but now I have high expectations for long-term storage of my booch whenever I brew up too much. I look forward to this week since I have other bottles of different flavors brewed and flavored from the same batch as my 'headed' booch. I just poured my first taste of my HOME BREW Kombucha and it is absolutely!!! fantastic!!!! It is SO MUCH better than the store bought brands. Thanks SO MUCH for the great brewing kit. I will be ordering more Green Goddess tea soon. Works great! The videos instructions were very helpful and customer service is second to none! I've already started to share Kombucha with friends. Very happy with my purchase. Kombucha Kamp totally delivered on the promise. I used Hannah's videos and recipe to make my first one gallon batch. Even in San Francisco's cool climate, my scoby grew into my big baby in 2 weeks! I immediately purchased the continuous brewer with the heater and cautiously added my baby to the cozy batch. I now have a big fat mamma that churns out Fizzy Awesomeness as fast as I can replace it. Thanks Hannah for my new hobby, health, and happiness! I am new to brewing, and this kit appealed to me because it just seemed so easy... and it is! Hannah makes it easy with all of her videos and her how to guide. I did have an issue with the stand for my CB, but I called and Hannah sent me a new one right away. It's very exciting to be brewing and drinking my own 'buch everyday! I was very intimidated by the whole Kombucha process UNTIL I found Kombucha Kamp and the Continuous Brewer. I LOVE our brewer and it is alive, healthy and so good for our bellies. We now have 2 brewers going and it is keeping all of our bellies healthy. Hannah is so great and her videos are so helpful. I contacted customer service when we first got our brewer and they were very quick with a reply and extremely helpful. Thank you Kombucha Kamp for helping us to brew our own KT... We Love It!!! I got the complete kit and I couldn't be happier. I love that Hannah had the videos so I could go step by step with her and brew my first batch of KT. (Look at me only 3 wks in and I am using the lingo...LOL) I don't have a lot of patience so I had to fight to not look at my scoby forming. On the 7th day I peeked...LOL It has taken me till now to actually get the fizz in the KT with out having to do a 2nd fermentation. I love the taste of this so much better than the store bought. Mine does not carbonate up as much as the store bought but I am okay with that. It foams when I pour it and when I bottle it I can see the bubbles. My favorite flavor is coconut water and lime yummy and I have done hibiscus too. But mostly I drink it plain. I love the CB because I don't have to mess around with my scoby. I just add what I take out. I drink a quart I put a quart back in. I think that my scoby likes getting fed more often than waiting for me to bottle and replace. This way it has a continuous supply of sugar. I did have a problem with the heater that I bought extra and Hannah was right there to fix the problem. Thanks Hannah the new one works great! The CB is the only way to go so you can have KT always ready and waiting for your. If I can do it anyone can. I did ask a lot of question that were in the handbook so make sure you read it. I am very happy to have found this site. I give Kombuch Kamp 5 stars for great product and customer support! I had tried the single gallon brew method and it was a bit tedious - I ordered the continuous brew pack from Kobucha Kamp and now I am a 'free bird' to enjoy the convenience of having delicious KT on tap any time we want it! It is fun to experiment with the various flavors or just enjoy it straight up.... could not be easier. But what I love even more is the superior customer service Hannah and her team give customers. I have always received an immediate answer by email when I've sent in a question. I love the organized website and the various products to enhance the KT brewing -- love my brewer cover -- it looks very professional sitting on my counter -- not a cluttered mess at all -- Thank you!!! I got the complete package, I love the continuous brew method. Thank you for putting this package together, it makes it so easy to brew kombucha. I got the complete package, and it was and continues to be so easy and perfect. I love it! I was super excited to get my continuous brew package once I finally decided to "bite the bullet" and order it. The goodie box came first, with the beautiful SCOBY's and the like, and finally the main attraction, my vessel. I thought the craftsmanship could have been a little better on the legs for the stand, mine were chipped in a couple spots, and also the screws didn't go in very easily, plus I ended up stripping a few of them and needed the replacement ones that were sent with the kit. It was also a struggle to get the spigot on flush against the vessel, and I had to redo this process two times before I felt confident that the booch wouldn't leak out. Even though there were a few minor mishaps, I still feel that this is a quality product, the step-by-step videos are very helpful and easy to follow, and I feel like my end product will be everything I want and more. The "outfit" for my vessel is also cute as a bugs ear :) I can't wait to try my first batch of booch from my new vessel, it's going to be delicious! I have been busy making a variety of flavors of kombucha teas, love the continuous brew. This is my first experience with fermentation. After reading as much as I could, I bought some GTs Kombucha and was hooked. Because of the price, I wanted something I could make at home that would be more economical and allow me to make the choice of flavors. I visited several websites, but Kombucha Kamp was the best site because of the detailed information and options available. I made the choice to get started and purchased the Modern Porcelan Complete Set. Hannah provides the best instructions! They are chronological and specific and easy to follow! When my set arrived, I was eager to get it set up and running. Best I can remember, I got everything going in about 30 minutes. Then, the wait for the scoby to do its work, Seven days later I had the best tasting KT! Thanks, Hannah, for all the time you spent preparing the best instructions, videos, and history of KT! I love the continuous brew system. I was somewhat intimidated when reading about how to brew Kombucha - the batch system seemed complicated and prone to failure. One of my friends who does it sets aside an entire day, each time. The continuous brew system is EASY, easy, easy! The instructions are clear and user-friendly. By about the third time of making a "topping off" batch, I felt like an old pro. Only takes a few minutes. Glad I made the investment, so nice to have some every AM, and not be spending $3.99/bottle like at the health food store. Shipping fast, customer service excellent and very responsive. My husband and I are so excited with our continuos brewer, it came in perfect condition and very easy to assemble; the videos are a great help and your support has been magnificent. Thank you so much for your dedication and good work. Love this product. I always manage to forget to take care of my kombucha in the past, but know with it on the counter, I can see it and drink from it daily without disturbing the scoby. I just started adding to it this week. Finding out I have to drink it much faster than I have been. This is a wonderful product that I would recommend to friends. It is so much easier with the continuous brew. So much easier to fill my bottles. Thanks so much for offering this product to us. This is so much better than my old method of gallon jars/heating pad, etc. It's so easy to steep more tea, let it cool and simply pour it into the brewer. I haven't had to trim my scoby yet, so can't attest to what's involved in that, but am glad it only needs to be done every 4-6 months! I'm also very glad I bought the heat strip dimmer system cause I live in Denver. Now I need to figure out how to start flavoring my bottled brew but hopefully I'll find instructions for that on KK website! The Complete Kit for continuous brew method made making Kombucha (KT) so easy. I hesitated to make my own KT as it seemed like too much effort. This continuous brew kit, complete instructions, and the up to $4 price tag of retail KT got me to move forward. It took a bit of time to get used to the idea of the scoby and what it was supposed to look like. Now it all seems so easy. Having KT easily and readily available is great. I decant bottles with flavoring and also sometimes just draw off a glass for drinking from the brewer. My husband is now drinking KT and I'm thinking I need an additional brew set up to make sure we have enough. Thank you Kombucha Kamp! What can you add to all these great reviews. I feel the same. So easy. So good. So healthy. So happy! I really have been enjoying my brewer. It was easy to set up with the videos and it has saved me a ton of money. It is even more delicious than store bought. Hannah's blended tea makes WONDERFUL Kombucha. What I really like is the combination of all the good for me teas. Would not have thot to blend my tea for a batch. I LOVE my continuous brewer! All I do is let it ferment for 7 to 9 days, bottle & flavor about a gallon, and add the fresh sweet tea to the crock. It's that easy! I have lots of frozen wild cherries & elderberries from our yard. Just pop in a handful in each bottle, let it sit for 4 days, refrigerate, & enjoy! I also have frozen blueberries, which makes delicious Kombucha. After trying kombucha from a local store, I was pretty hooked, but at 4-5 bucks a bottle, it can get expensive pretty quickly. I surfed around awhile getting info on how to make my own, and it seemed the Kombucha Kamp continuous brew system was very complete and easy to use, and got alot of great reviews, so I decided to try it. It turned out to be a great choice! This kit is really easy to set up, and has a ton of clear instructions and videos. The system is easily pumping out around a gallon a week right now, with no problems! I'm very happy with the product and support, and would recommend it highly to anyone. The Complete Continuous Brew Package made setting up my new kombucha brew center so easy! I loved that it came with absolutely everything (except the water) that I needed. The directions included in the box were easy to follow. All of the pieces are well made and the videos provide TONS of tips for making sure you get your first batch going in no time. I love it! The Continuous brew system is a snap to set up and easy to maintain. As someone new to brewing Kombucha, I LOVE this nearly fool-proof method, especially the useful set up videos. And, Hannah, your tea blend is wonderful! The Continuous Brew system made it so easy to make my KT. I'm on my second batch, so far, so good. It's actually a lot of fun making your own. I love my kombucha supplies and I was psyched to upgrade to the CB method. I do wish the website was easier to use--I find it cluttered, outdated looking and overly complicated. Love my continuous brewer! It was so easy to order, was shipped quickly, and incredibly easy to set up. The clear instructions took any guess work out of the process and have been brewing regularly since! It is so nice to have a constant supply of kombucha, with enough to experiment with flavors and take risks without "wasting" any. Our whole family drinks it now- what a great way to keep everyone healthy! 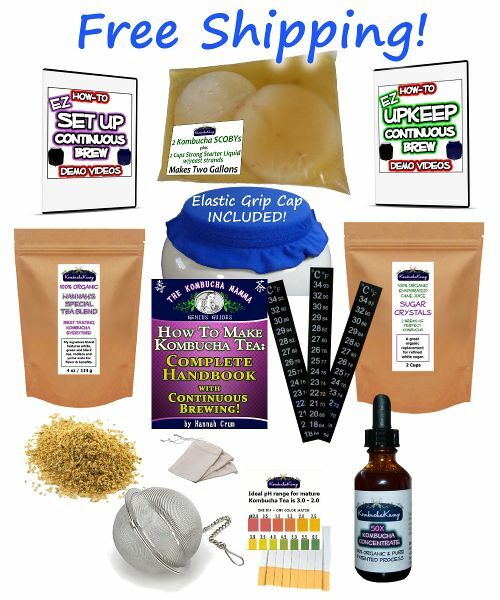 This kit is fantastic - everything you could possibly need to make amazing kombucha. The email support is prompt and friendly. The product is super high quality. The kit is basically fool-proof, written and video instructions make an intimidating process so easy! What a great system to get started with! I knew I wanted to get started but didn't know anyone who did, so I bought the Complete Brewing Kit with a Stainless Steel Brewer and a heater. Nothing could be easier than watching Hannah's videos and making your first, second and third batches of Kombucha. I am in remote locations from home, and so I brew in both places now. Love this system, recommend it to my friends and family, as well as my own websites, blogs, social media accounts, etc. Hannah has it all worked out, has done all the sourcing, and thinking it all out. Thanks for a great product! I love my brewer. It was an east set up, and simple to do. Now I can enjoy my tea anytime. I feel better physically and mentally since drinking the tea. I love that I always have it on tap now! Hannah was so helpful with any questions I had as well. Thank you ! My ex boyfriend introduced me to kombucha. When we split up and I asked him how to make it-he told me not to bother, that it was too hard. So I did my own research....and found these continuous brew kits from Kombucha Kamp. The information provided on this website and also in the guide made me confident that I could brew my own Kombucha safely and with support if I needed it. So I ordered the kit-and its been amazing! Everything you need to brew is there, the instructions are informative and very easy to follow. Thank you so very much for providing this product and back up service. I bought the continuous brew package. I immediately got brewing and now I am hooked. I find here in AZ it only takes a day to get the sweet tanginess that tells me my SCOBY has done its job. A dash of cherry cider and my KT and I am good to go. Thanks K Mama for your care and great service. I received my package and began making the Kombucha right away!!! It is so much fun and I am creating some great stuff. Your products came immediately, easy set up and made this whole process so easy; thank you!!! I started drinking my brew on day 8, I just love the taste. I am waiting for my bottles to arrive so I can decant with ginger and chai spice. I really notice a difference in my digestion! I feel so good inside (it is hard to put it into words), and it has only been 9 days of drinking 4 ounces twice a day. I have struggled with digestion issues for probably 20 years or so. I stopped my enzymes, fiber pills and probiotcs when I started to drink the KT, just so I could see and feel if is infact helping me. I can say it is helping me 100%...I am so grateful for this landing into my lap (so to speak). Thank you for the great instructions, which are very simple and I can't wait to share with friends. I bought this for my wife for her birthday because she had wanted to try making Kombucha. She had been buying GT's from Whole Foods for $3.50/bottle and really liked it but wanted to make it herself so it was cheaper. It is absolutely fantastic. We get so much every week. We had enough of the bottles saved up, we just refill them over and over. We get about 24 16oz bottles a week. We have been making so much that I have taken up drinking it as well and have been passing it out to my fellow grad students. It was definitely worth the purchase. We just bought some more supplies. Love it! Easy for beginners such as myself, using the videos has been very helpful. Definitely better than store bought. Considering purchasing another one to keep up with household demand. Again, LOVE it!!! We received our brewer and started using it right away. It has been so easy to serve everyone who visits our home a delicious cup of bucha. This is so much easier than the batch brewing method! I am so happy with my continuous brew kit that I am ordering another one! I put a 4 oz shot glass under the spout and we just do Komucha shots all day!! I would recommend getting the heater to start with, we plugged it into a plant mat thermostat and it works perfectly! I can't say enough about Hannahs information and personal touches, I feel as if I know her!! The only problem that I can come up with this product is that the crock is too small, because my family drinks it SO FAST! My 2 year old only asks for "buka" now. We have to mix apple juice in with it to even get her to drink it anymore, and that was her favorite thing in the world before getting this brewer. We received it in under a week and had a great first batch the following week. This was 2 weeks ago, and I have already had to add about 6 more gallons of tea to keep it going! JUST LOVE THIS PRODUCT! I LOVE my deluxe kit, plus heater. I really loved the ease of learning about continuous brew with Hannah's videos. This is my new project - it alternately fascinates and repels my friends and family! Extremely, stunningly simple - I bought the mid level kit and a heating strip and just bottled my third batch! Mine is only taking 4 days to get to a ph of 2 and the store bought taste! I think that once I get a supply, I will leave the heater off and slow things down some. I'd highly recommend this - it takes very little effort or time and saves tons of money if you imbibe regularly! The continuous brew method is so simple! I wanted to add kombucha to my daily routine, but my pocketbook just couldn't handle the expensive store-bought servings. I started looking into home brewing. With all the other things I have going on, I wasn't sure I could spend too much time on this. Enter Kombucha Kamp and Continuous Brewing! Hanna makes this soooo easy; just use her instructions, guides, and videos. With just a few minutes a week I have more kombucha than I can drink! I'm giving it away to friends and sharing the good Kombucha word. I chose to go with the stainless steel brewer, and I love how it looks on my counter. Visitors are always asking...now I can share! I'm new to home brewing, and felt completely overwhelmed starting out. It seemed like the most confusing thing ever, and I was confident that my kombucha would turn out less than tasty, at best. I can't believe that I was so stressed by it. Continuous brewing is so simple; it practically takes care of itself, and my kombucha is absolutely delicious. I have a perfect system set up where I always have kombucha to drink. I could not be happier. What a great investment! I cannot sing the praises of Hannah enough. Her products and customer service are fantastic! Everything came intact and worked as promised. I absolutely love my brewer and the booch it produces tastes better than anything purchased on the market thanks to Hannah's special brew. Love, love, love Kombucha Kamp!! Absolutely IN LOVE with our continuous brewer! Everything you need is included in the package and it couldn't be easier. Also everything I have ordered from this site ships quickly. Everyone who comes to our house tries the booch straight from the tap and all of them have said it tastes better than store bought. Not to mention it's very cute sitting on my counter. Thanks Hannah for an amazing product and we can't wait to dive deeper into this healthy adventure. Once again, my heartfelt thanks to you. I am up and running!! I got everything installed and the temp of my first brew is a very nice 72 right now although it will probably get a bit warmer as it sits. You have without a doubt the best customer service I have experienced in many, many years. Your video instructions are extraordinary in their detail. I watched the videos again one-by-one to be sure I got everything right. The pH strips were right on target and the scobys had started a new one at the top of the bowl. The assembly was easy and I think the brewing system is absolutely GORGEOUS!! I can't wait to get my first taste. It makes it so easy for me, as a 78 yr old, to be able to make kombucha. You should be saying, "If you can make tea, you can make Kombucha even if you're a senior citizen." Thank you for such a great quality product. I look forward to doing business with you for a long time. Once again, thank you and may all your desires be fulfilled. The box containing my Kombucha Kamp brewer looked a little the worse for wear when I picked it up from my local post office. I don't think officaldom (including customs) pay too much attention to 'handle with care notices'. I needn't have worried about the contents, though. The porcelain brewer had been carefully packed, and so had all the additional components of the brewing kit. The 'scobies', floating in their nutrient ponds of starter tea, and robustly sealed in a double pack, looked serene and healthy despite having crossed the Atlantic. Screwing together the stand and mounting the spigot in the brewer proved easy as the instructional drawings are easy to follow. I don't always take advice, but this time I am glad I followed Hannah's instructions carefully despite being impatient to start my brew (Hannah's website and preparatory videos build trust), & I took care to test the spigot for water tightness by filling the brewer with water and leaving it for the night. It leaked, and had to be tightened. Thanks, Hannah, for the clear advice on testing. Following the recipe for making the initial brew was child's play. Then I 'cured' the brewer with white spirit vinegar, added the brew and additional spring water and waited. Yes, Hannah is right. This is the tough part. On the 8th day I tasted. Interesting 'nose'; great flavor. On each successive day the brew became a little less sweet and the flavor more interesting. Before my compulsive tasting (yes - the brew is that good!) drained the brewer, I tapped off two bottles for the fridge and made my second brew. It's been two days, and - sip, sip - we're almost there...and - I don't think it's my imagination - the flavor has deepened with this second batch. Right now I am drinking a Kombucha toast to Hannah...Many thanks! I just tasted my first batch of continuous brew after 11 days, and it was absolutely perfect. Now I am second fermenting with cranberry juice and your chai flavoring. This is so easy and fun! Thank you Hannah! I am very thankful for the continuous brewer. My husband and I have been thinking about brewing Kombucha for about a year and a half, but weren't interested in keeping track of another living thing in our home (baby, plants, kefir, sourdough). So we just kept putting it off since I know with Kefir and sourdough it's like a pet you have to take care of often, and I knew batch brewing Kombucha was similar. Then I ran into Kombucha Kamp (a local food culture business referred me to you-Fab Ferments)! When I learned about the continuous brew method, I knew we could have better kombucha, less brew time, more of it and less contamination and kitchen time. My husband was on board immediately and we are really enjoying bottling it and trying to get family and friends hooked! AWESOME! Just got my CB on 01/02/2013 and immediately began the process of my first continuous brew. It's been 8 days and I just tested the PH and it's perfect! Having my first 4 oz. glass (with an ooglie in it) of my homemade Kombucha as I type this review. I am very happy and pleased with my purchase! I highly recommend including the dimmer switch heating system if you live in cold climates during the winter months. You can't go wrong purchasing your Kombucha products from Hannah! She ROCKS! I'm now a Kombucha fan for life! THANK YOU, HANNAH! As a person with food intolerances I was immensely delighted when Hannah herself answered my questions on the phone personally. The customer service and response from Hannah is equivalent to that of the "good ole days" when companies actually cared about the results of their products that are used by consumers. Absolutely recommend doing business with this company, they even resent links to the guides when my computer failed to open them so that I could access them on another computer that supported Adobe. Everything here is what you see is what you get, and that is a wonderful things. Tried to make my own kombucha and it didn't turn out well. Bought the 'no frills' kit and had great tasting kombucha within a week. Have kept it going. It's very easy. Never get to the bottling stage. We drink it too fast. I guess I need another kit! First off I have to say Hannah and Alex (owners) are incredible. I did alot of research on kombucha brewing. I was so nervous but I wanted to try it. So I splurged to make sure I would definitely do it. Bought the continuous brew. Before my shipment arrived Hannah sent emails everyday getting me ready for my kit to arrive. The day it arrived I was so ready-started a batch right away in a gallon jar. 7 days later I had my first batch. Kept thinking to myself I must be doing something wrong this is to easy. Got my continuous brewer going and 9 days later whalah I had bubbles I was ecstatic--we drink our brew everyday. Mama Bertha ( yes I named my scoby) LOL well she made me a baby-(no name yet)so I have the baby and my extra scoby(Beatrice) in their own hotel room. I will probably start another gallon jar on the side cause our adult children & friends are loving this to. My favorite so far is lightly warmed with green chai and lemongrass/ginger. I have been so pleased with my continuous brew Kombucha Tea. After seven days I was able to enjoy my first batch and was pleasantly surprised that the taste very similar to what I was buying in the store. Now I've been continuously brewing for 3 weeks. The taste just gets better every day. I recently purchased a continuous brewing system and was excited to get my first batch of kombucha started. I must say it is incredibly easy, and watching the videos was really helpful. I just tasted my first kombucha this past week. Delicious! My next step will be to add flavorings, but even the brew without flavoring is amazing. I am especially delighted because my grandsons enjoy the taste. It's a terrific feeling knowing that I can give them somethings besides juice or the gatorade-type drinks that are so popular with kids. The pathway to better health is paved with baby steps. If I can convert any of my loved ones to a healthier lifestyle, I will be delighted. Thank you for a wonderful product and lots of support. Where have you been all my life? An ailing friend passed off a "mother in a canning jar to me a few weeks ago because she was too sick to deal with it. Raised on a farm in the fifties, an avid organic raised bed gardner, coupled with serious sprouting year round, fermenting was the icing on the cake so to speak. I took the ball (SCOBY) and ran with it. As an avid nutrition researcher and practicer, it was a natural for me. I immediately dove into finding the best source on the internet and BINGO! Up pop's Kombucha Mamma! Days later we met at the Second annual National Heirloom Exposition. Few days after that I spent time with Hanna at the Farm to Fermentation Festival in Sonoma County, Ca. By that time I had already received my Deluxe Continuous Brew Kit. With a Thermapen digital thermometer, I know exactly what temp my brew is. Couldn't be bubblier!! Thanks Hanna & hubby. Love your style. Wisdom from my late lovely MOM: Gardners always know the BEST DIRT! To our health! The Continuous Brewer Complete Package does simplify the making of Kombucha to a pleasure. With each brew the lightweight cap enables one to observe the miraculous formation of the SCOBY. Decanting is a breeze wether by the cup or gallon. The warmer is waiting for the approaching winter to be put into service. I have the utmost confidence that all will be well once the outside temperature dips into the teens and the inside temperature stuggles to maintain 68*. Everything I have read from Kombucha Kamp has been right on with accuracy and truthfulness. I could not be more delighted. And when Hannah answered the phone twice to answer my questions I was floored - no answering machine, no operator, just Hannah. I started brewing a few months ago and am now preparing 2 gallons a month and loving it and the effects it is having on my well being. Thank you so much. I laugh each time I start to describe the process to others and talk about a culture and wanting yeast and bacteria to grow!!! Thank you for encouraging all of us and for making it easy to do. Each time I have had questions they have been answered quickly and clearly. That was so easy! I have tried to make Kombucha before and it was so confusing and I managed to promptly kill my scoby, which by the way was a tiny dehydrated wafer looking thing... Have already started a couple of flavored bottles and can't wait to see what it tastes like. Thanks for such great products and such an easy step by step approach! I am so glad that I bought this system. Worth every dime! I'm delighted with the Continuous Brew kit which has been in production for a few weeks now. The instructional videos and booklet were invaluable. I'm now enjoying my daily pint of kombucha at a fraction of the cost of the store-bought brands. Thanks Hannah! The first time that I tried kombucha was when I bought it at the grocery store at around $3.50 per bottle. I was torn because I liked it so much but it was too expensive. I attributed some of the adaptogenic effects to what I have experienced with ginseng and the others; meanwhile, many of those options are expensive as well! The step-by-step process laid out in the kit suffices extremely well for what needs to be done (and this is coming from a person who is a visual-kinesthetic learner). The videos demonstrated the ease of the process and doing it by yourself even proves to be rewarding. If this purchase were to be solely based on receiving the education, it can also be viewed that the products came free with your class! I've been brewing kombucha for awhile now and debated for days whether or not to invest in a kit. I'm really pleased that I decided to make the investment - not just for the quality of the materials I received but also for the knowledge and positive energy Hannah imparts with her kits! I learned a lot of things that I didn't know while watching all the videos and reading the book that came with the kit. The scobys and starter liquid that came with the kit were in excellent shape and brewed up a great batch of kombucha in a little over a week. Hi Hannah! I love your continuous brewer's kit! Thank you for all you do! I've had the complete cont. kit for three weeks, and I'm on my fifth or sixth cycle. My SCOBY is super healthy and growing. Hannah's instructions, videos, and complete kit have made it really easy to make great KT. Thanks! I cannot say enough about this package. The videos are awesome and go over everything. I think I watched them five times but I'm a little neurotic that way. The guide is so fun to read and it really didn't take very long at all to set it up. As the song says, the waiting was the hardest part but now we have enough booche for everyone in the house and its never more than a day or two before we're ready again. Get it you won't be sorry and Hannah is wonderful! Thanks!!! I have been very happy with the CB method and my first batch was great! so far the customer service has been good too. I have only been doing Kombucha since mid march. I was looking for something that would cut my craving for sugar as I have been sick with toxic mold from my house. House in now healthy, but I still have the infestation in my body that was screaming for sugar. I noticed about a week after starting to drinking the store bought bottles that my sugar craving was greatly reduced. I was hooked. I did lots of research on line and was drawn to Kombucha Mama. I now have a continuous brewer and am enjoying the simplicity of the brewing process as well as the availability to the booch. I have also been able to share kombucha with others that are having medical issues. Again, I definitely agree with the other reviewers, it is so easy to do the CB. Hannah's instructions are easy to understand and follow. She makes herself available to answer any questions. I never imagined that is would be so easy to brew Kombucha, and lots of it. The brewer is good looking as well, and Hannah's instruction is informative and crystal clear. I can brew and flavor it to my taste, have enough for a nice variety of flavors, and replenishing is as easy as brewing tea. I can already feel my system responding to the tea - my sugar cravings have gone way down and I have almost completely given up coffee. I would never have brewed my own Kombucha if not for this kit. It's just too intimidating for someone like me and I don't a have the mind anymore to keep up with a weekly jar. Reggie and I can sip from the tap when we feel like it and Hannah has been real easy to get ahold of whenever we need anything. We especially like the Hannah's tea blend and will be back for more. Just sampled my first continuous brew batch and my wife thinks it is better than anything I have bought in the store. Package is great, all went well. Thanks Loads! Just received my Kombucha complete continuous brewing kit yesterday. My family and I are new to Kombucha and as you know it is expensive to purchase by the bottle. I set everything up yesterday. It was so easy and so much fun for the family. The videos and book were easy to follow and made the process so easy. I advise you to watch the videos and look through the book before you receive your kit so your ready to make Kombucha as soon as you receive your kit. We have our first batch brewing and can't wait to try it in a few days. Thank you so much Hannah for being so helpful and making the process both easy and fun. I have to say that Hannah has really developed an incredible system that is super easy to understand and user friendly. I was very afraid of purchasing something online from a small company, but I have to say Kombucha Kamp is very reputable and the complete brewer set is amazing. I made my first batch of Continuous Brew KT on Friday of last week and I am drinking it 9 days later. If you are considering purchasing a kombucha kit and comparing this one to others I would strongly suggest you choose KK. Good Luck and Happy Brewing!! Hanna is professional! Her warmth and enthusiasm are welcoming... The Brewer kit worked exactly as advertised if not better! I had my eye on this kit for a long time, and finally took the plunge. I'm so glad I did! Hannah has done a great job of making this process fun, easy, and elegant. Yes, I said elegant. Before my kombucha setup looked like a ghastly science experiment (and grossed out my family). Now I have this lovely kombucha dispenser with its cute purple t-shirt! It looks great, makes flawless kombucha, and makes me very happy. Continuous Brewing is phenomenal. A convenient and loving way to grow Kombucha culture and share with your community. My family drinks it and my body loves it. This product pays for itself over and over again. I love my new KT continuous brewer! It's hard to walk by and NOT take another little sip of the latest batch. I also love having my own flavored Kambucha without adding to more glass consumption and cost related to transportation of a product made elsewhere. This is LOCAL!! This is a really great set. The step by step videos and the manual answer all the questions you can have and if you still have some, you can simply ask Hannah. Continuous brewing is the solution for busy people. It is so easy! I love my CB system, and have found Hannah to be warm, competent, and easy to work with. No trouble whatsoever with the delivery and set-up. I'm appreciative of the one-on-one guidance Hannah gives. Go ahead and buy the CB method - you know you want to - and you will NOT be disappointed! I was drinking commercial kombucha and spending a bunch of money on that. Being a do-it-yourselfer on other foods I figured I'd see about learning how to make it. Hannah's website was great for that and of course I found the CB packages. That made it easy to get started all at once. So I ordered the Complete Package and once I recieved it started my first brew, with the help of the ebook and how to videos. Very easy to set up and I've run through a couple of cycles already. I would recommend this product package to anyone who is interested in continous brewing. I am so happy that I am a new owner of this awesome continuous brewing system! It is beautiful and exactly as explained on the website. I ordered from Kombucha Kamp becuase the website is so professional. The entire ordering and receiving process was seamless and I am so impressed with the level of communication in the form of emails, videos, pdfs and instruction that were included with my order. I would definitely order from Kombucha Kamp again. This Continuous Brew system is really as simple and rewarding as stated. I set it up about 10 days ago and I now have 6 bottles flavored and a crock full of tea waiting for me to drink any time. This will pay for itself in no time and I love making it myself and experimenting with flavors. The CB kit is great. Hannah's start-up videos made it easy to get started, in spite of my initial jitters. Thanks so much! Paid the extra for fast shipping and arrived To Sydney Australia in five days!!!! Amazing. No customs issues simply too good!!!! Thanks Hannah I'll be back for more!!!! Kombucha has changed my life!!!!! If you're serious about drinking Kombucha and your health, you really need to buy this package. It seems expensive but it pays off, in reality it's a SUPER bargain! I was spending way too much money buying kombucha at the store everyday and after I purchase this kit,it saved me money and when you make kombucha at home the health benefits are way better and the Kombucha is stronger. When you buy Kombucha at the store it's been under the light for too long and that's not good for your Kombucha. I store my bottled Kombucha in a dark place. Buy the package! you won't regret it! We are really enjoying the Continuous Brew method and I had underestimated its value in the beginning. I have referred back to Kombucha Kamp's well laid out pages many times. What a wonderful service it provides and really helps brewers turn out a quality product. Wonderful! Bought this as a gift for my daughter. She lives in Washington state and I am in Vermont. We have had alot of fun comparing notes about our experiences with brewing. She loves her's plain while I enjoy flavoring mine. It has saved her and her household alot of money since there are 4 "booch" lovers. Thanks for offering such a great product. I was really afraid to try it, but I was amazed at how easy it really was. I made my first batch as soon as it arrived, and it was actually even better tasting than some of the store bought Kombucha I have tried. I love my Continuous Brew package! The main reason I wanted this was so that I could share Kombucha with my family. When I was batch brewing, there was only enough for me. Little by little my booch started disappearing, so I decided to upgrade and share! Another thing that drew me to the complete package was not having to take my scoby out and start over every time. I also don't have to make multiple batches to share! Now all I do is add to my booch! I am glad I decided on the CB method. It is simple to do and I have enough to share with friends. I am starting my 2nd batch and enjoy the idea of trying different flavors. bought this for a gift for my daughter. She is in love with it. Her room mates are excited about home brewed KT and I get updates from her everyday. She is at the sampling stage now and is having fun. She is a cutomer of commercially made KT and says this will save her a ton of money. Best b-day present I could give a 30 year old..is what she told me. I cannot completely state how pleased I have been with the whole process with Hannah and this Continuous Brew. It's so easy to do once you read the guide and watch the videos. I make everyone have a glass when they come over and my wife will have some after tennis. She says it tastes really good after playing. We got the white brewer which is nice and clean looking, I recommend that one. Thanks Hanna! I'm loving my continuous brewer...and the booch. All arrived timely and in perfect condition. Very easy instructions, by someone who obviously loves & believes in what they do. Thanks for sharing. Great customer service. Good results brewing the first batch. I have been paying Whole Foods $4.00 per 16 oz. bottles. With the hobby I will save money and learn how to live healthier. Continuous brewing is so easy. I am so glad I purchased the heating band to go around the vessel because the temperature fluctuates in my house so much that I needed to have a consistent amount of heat. I will be attending Kombucha Kamp in person soon to see if I can improve my new skills. Thank you Hannah for all your help. I love seeing my CB kit...makes me feel like I am consciously caring for myself, which I am more convinced now than ever before that women need to do more of....my first batch was really simple, mostly due to really simply laid forth instructions... to be honest, I watched the videos 5 days after I started the batch and got a tad worried thinking I ruined it b/c I missed curing the container with vinegar instead of just wash/rinsing and the added 3 drops of concentrate! I taste tested the almost week-old brew and all seemed to be on track --phew! I did add the concentrate at that point... and it still seems all is well! All this is to say that the process was easy and the living culture must have known how eager I was to get started that God encouraged it to overlook my impetuousness and nurtured nature to keep taking a healthful course... I cannot wait to start my 2nd stage of fermentation-flavor-brewing!!! I like this kit because it came with everything needed to get started brewing KT. I probably prefer a glass brewer so that I can see whats going on without opening the top. I did have a problem with the pH strips ..... Hannah promptly sent out a different brand to try. Much better but still tough to read. Hannah has also been very engaging with me via email and phone ... much appreciated!! To be honest, as a newbie (1 month old), I've never done anything but CB. To me, there's no better way and it fits my life/schedule perfectly. Just recently a friend of mine gifted me with a brewer already set up and rolling...can you imagine! ?..what an incredible gift! Anyway, my challenge then became figuring out just exactly what to do with this rig. So, I stumbled onto your website and felt right at home. Found everything I needed - bought a couple heaters and another brewer (now I have 2!) - and it's working beautifully! You've been so helpful in all the emails you've sent me....and it seems they show up exactly when I need them! Not sure how you do that but it is a bit uncanny. So, thank you for what you do. You are appropriately named! I have explained to many people the process of continuous brewing and the benefits I see from it. The first being, you always have tea available. That's the best. I decant a few bottles to have on hand or give away and make a batch of tea to add to my brewer. I can enjoy my decanted bottles, flavored many different ways. Then about the time I'm out of tea I have a new batch ready and waiting to be decanted. Love it!! Adding to the batch is very easy too. I just brew up my next batch, mix it, and let it cool in a glass jar and then pour it in. I say my little blessing upon the tea and the brewer does all the work. The brewer looks great sitting on my counter. The pour spout is convenient. I'm very glad I purchased it. The first time I looked up how to brew kombucha on line Hannah's website was the 2nd one I clicked on. Her warm personality pulled me in right away. I was hooked immediatley! So not only was the Continuous Brewing kit at my door the next day but it had very easy instructions to follow. I do feel healthier, have more energy, and I know at any time I can email her with any questions. Most important, her website is a wealth of knowledge when it comes to any thing to do with kombucha. She is the kombucha momma! The health benefits of continuous brewing were almost immediately apparent in every aspect of my life. And the complexity of the flavors I am able to achieve after bottling my brew are better than any store brand I have tried to date! My body feels better when I am able to keep it in balance; drinking kombucha every day is a very important part of my personal health routine. With the Continuous Brew method, enjoying fresh Kombucha is as simple as 1-2-3. 3. Replace what you drink. The Continuous Brew Method makes Kombucha accessible to anyone and everyone- which is exactly how it should be! I feel so blessed to have my beautiful brewer seated lovingly on my kitchen counter, changing my life, or at least the way I approach my health, everyday. Really..It's just so darn simple. If you are well organized and tidy,all you need is a small amount of time every few weeks to tend to your booch.